To unleash the full potential of public transport systems in achieving sustainable mobility, it is necessary to induce a modal shift among the growing numbers of urban commuters that use personal vehicles to get around. But for that, public transportation has to match the comfort and convenience of personal vehicles, write WRI’s Chaitanya Kanuri and Pawan Mulukutla. Urban mass transportation is undergoing a revolution in India, with a total of fifty Indian cities planning to build metro rail networks, and massive outlays of investment already being made in metro rail infrastructure. However, to unleash the full potential of public transport systems in achieving sustainable mobility, it is necessary to induce a modal shift among the growing numbers of urban commuters that use personal vehicles to get around. This is only possible when public transportation begins to match the comfort and convenience of personal vehicles, with high levels of service and seamless end-to-end connectivity. 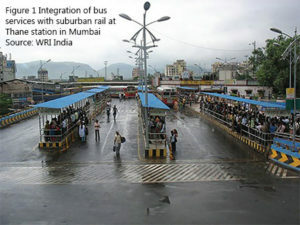 The Station Access and Mobility Program (STAMP), led by the World Resources Institute India (WRI India) and the Toyota Mobility Foundation (TMF), provides a blueprint for channeling innovation, partnerships and new trends in mobility for more sustainable urban transportation systems. Forwardthinking public transit agencies across the world are embracing more multimodal service provisions, combining the scale and affordability of mass transit with the choice, comfort and flexibility of new mobility services. Starting with the metro in Bengaluru, STAMP aims to catalyze sustainable urban mobility in India, centered around multimodal public transportation that is accessible and affordable for everyone. As India continues to urbanize, urban mobility in the country is at a critical threshold, veering towards increased private vehicle ownership. The total number of registered motor vehicles in the country has grown seven-fold over the past two decades, from 30.3 million in 1995 to 210 million in 2015. While only an estimated 11 percent of households in the country own cars, sixty percent of these households are concentrated in urban areas. This exponential growth in vehicular numbers and a steady uptick in the travel demand of urban inhabitants have resulted in chronic congestion and gridlock on urban roadways, leading to a loss of productivity for urban economies. The revised Bangalore Master Plan 2031 estimates that the city’s residents lose around 600 million man hours annually due to congestion, equivalent to losses of INR 23.5 billion (USD 367.42million). In addition to the economic implications, rapid motorization, growing travel demand and high vehicular densities also have adverse environmental impacts, with the transportation sector contributing to a higher energy demand and poorer air quality. It has been estimated that a shift from car-centric transport to one based on public transport, walking and cycling can reduce global carbon dioxide emissions by as much as 1700 megatons by 2050, a 40 percent reduction of urban passenger transport emissions. Keeping in mind the need for sustainable urban mobility, the National Urban Transport Policy of the Government of India (NUTP 2014) recommends all cities with populations of over one million inhabitants to plan for mass rapid transit systems. In response, the Centre and various State governments are investing about two trillion INR (USD 31.27 billion) in building almost 900 kilometers of metro rail-based mass rapid transit systems (MRTS) across 18 cities in the country. At last count, about 350 kilometers of metro rail corridors are operational in nine cities- Delhi, Bangalore, Chennai, Mumbai, Kolkata, Kochi, Jaipur, Lucknow, and Gurgaon. Going forward, it is necessary to ensure that metro rail networks are integrated with existing transport modes and services, to minimize further dependence on private vehicles and to maximize the efficiency of urban mobility systems. It has been estimated that a shift from carcentric transport to one based on public transport, walking and cycling can reduce global carbon dioxide emissions by as much as 1700 megatons by 2050, a 40 percent reduction of urban passenger transport emissions. Multimodal integration is defined by seamless connectivity between different transport modes, serving to maximize the impact of public transportation and to enable sustainable urban mobility. When designed around robust mass transit systems, multimodal integration has both environmental and socio-economic benefits. It not only contributes to lower vehicular emissions and reduced air pollution, but also reduces commuting time. It can also connect more people to jobs and other opportunities.